my hospital says that they will do a vbac but they aren’t set up for it because the labor side is far away from the c-section side so if i try to do a vbac and end up having a c section it will take a lot longer to get me to surgery. do you think this is a legitimate reason to consider not having a vbac? im too close to my due date (7 days left) to change hospitals or doctors although i am beginning to wish i would have. .. The short answer is: No, that is not a legitimate reason to deny you a VBAC. 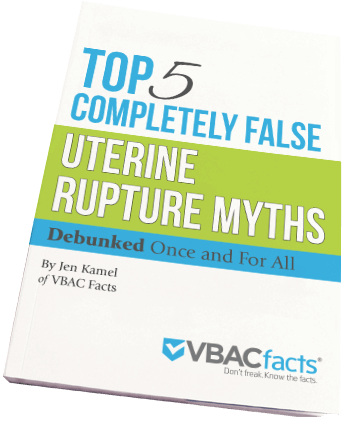 The reality is, you are less likely to experience an uterine rupture than a complication that has absolutely nothing to do with your prior uterine surgery. Since obstetrical complications arise during labor in women with no history of uterine surgery that require immediate surgical delivery, or more commonly in women with multiple prior repeat cesareans, how can a hospital claim that they are fit to attend those births, but not yours? Any birth (VBAC or not) could end in a medically necessary cesarean and any hospital (urban or rural) set up for birth should have a plan detailing how they will respond to those inevitabilities. I have also often wondered how often women with true obstetrical complications requiring immediate cesareans or even car accident victims requiring surgery, have been unable to receive that care due to otherwise healthy moms and healthy babies undergoing scheduled elective repeat cesareans occupying the operating rooms? With 92% of American women having repeat cesareans (Martin, 2006), I’m sure it’s happened, especially in smaller hospitals. I urge you to watch Dr. Birnbach’s presentation along with all the presentations from the 2010 NIH VBAC conference. The American Association of Justice article entitled “When every minute counts,” also discusses improving response times. These drills would also be helpful to the women who have other obstetrical emergencies including placenta previa, placenta accreta, and other complications that are more common in women with multiple prior cesareans. Scheduled cesarean section puts anyone else who experiences a medical emergency requiring surgery in danger because those operating rooms become unavailable. I wonder how often women with true obstetrical complications requiring immediate cesareans, such as your wife, or non-obstetrical emergencies such as car accident or gunshot victims, have been unable to receive that urgent, time sensitive care due to otherwise healthy moms and healthy babies undergoing scheduled elective repeat cesareans and tying up the operating rooms? With 92% of women having repeat cesareans (Martin, 2006), I’m sure it’s happened, especially in smaller hospitals, many of which only have one or two operating rooms. These routine repeat cesareans impact everyone and it’s only going to get worse. Women and their physicians may still make a plan for a TOLAC in situations where there may not be “immediately available” staff to handle emergencies, but it requires a thorough discussion of the local health care system, the available resources, and the potential for incremental risk. This is a huge change. Would provision of an anesthesiologist standing by waiting for an emergency at every hospital that practices obstetric care increase patient safety? In truth, that person would need to be doing nothing else clinically, so even being in the hospital might not qualify for “immediately available.” Looking at the numbers of anesthesia staff currently available, the minimum requirement to provide immediate anesthesia [per the recommendation of the American Congress of Obstetricians and Gynecologist] care for all deliveries would be to have all deliveries accomplished at facilities with greater than 1,500 deliveries annually. This would require that approximately three-quarters of all obstetric programs nationwide be closed (Birnbach, 2010). I am excited and hopeful to see the ripple effects of this new Practice Bulletin especially for women in rural areas. Hopefully the option of VBAC will become a reality for more women. Birnbach, D. J. (2010). Impact of anesthesiologists on the incidence of vaginal birth after cesarean in the United States: Role of anesthesia availability, productivity, guidelines, and patient saftey. Vaginal birth after cesarean: New Insights. Programs and Abstracts (pp. 85-87). Bethesda: National Institutes of Health. Martin, J. A., Hamilton, B. E., Sutton, P. D., Ventura, S. J., Menacker, F., & Kirmeyer, S. (2006). Births: Final Data for 2004. National Vital Statistics Reports , 55 (1), 1-102. Even though this post is several years old, I was hoping you could give me the name/location of the hospital with no 24/7 anesthesia and a 30% VBAC rate… or if you know of any other examples of rural hospitals offering VBACs. We are talking with our hospital’s CEO later this month, and some real world example could be very persuasive. And thanks for a well organized and informative site! This comment was made during one of the public comment periods of the NIH VBAC Conference. I want to say it was the public comment section after Dr. Birnbach’s presentation. You can watch all the presentations, including the public comment sections, here. Sorry I can’t give you a direct link to the specific video. Hey, this is in my group area. Hey Virginia, contact me! and thanks crazy smart VBACFACTSJEN! I’m so glad you brought this up because this is a factor in many states (like mine) that have large rural areas. VBAC is basically inaccessible in these areas, even though most of the big cities have it available. Frustrates me no end that the women in these rural areas are being subjected to so much extra risk for no good reason. Now, we’ll see if anything actually DOES change at the rural hospitals as a result of this change in guidelines. Kmom, Yes it will be very interesting to see how hospital policy changes and if/when VBAC bans are rolled back. And if they are not, what excuses the hospital cites. I love you. You are so crazy smart. Thank you for laying this all out there. Thanks Gina! I actually started writing this when we were at the NIH and just finally had a chance to complete it!